February 4, 2013 November 4, 2017 Elizabeth Ashworth22 Comments on Why did Shakespeare portray Richard III as a villain? Why did Shakespeare portray Richard III as a villain? Many years ago, when I was still in primary school, I remember being taught – as if it were a fact – that King Richard III was an evil man who had his nephews smothered to death so that he could steal the crown. For a long time I believed it, until I did my own research. Then I realised that what I had been taught was not necessarily true. 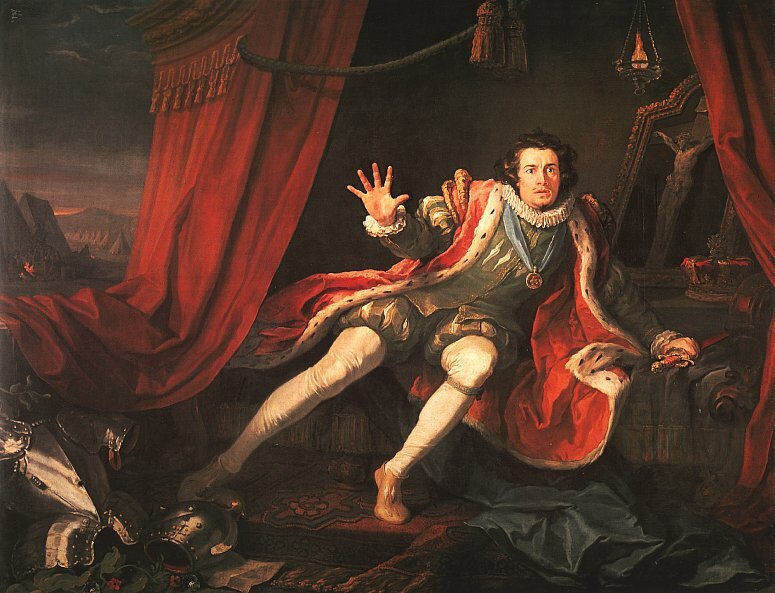 David Garrick as Shakespeare’s Richard III, painted by William Hogarth. What many people believe they know about Richard III is informed by the play that William Shakespeare wrote about him. They forget that Shakespeare was primarily a story-teller and they think that the portrayal of Richard as an evil hunchback king with a withered arm is an accurate one. Today, the University of Leicester has confirmed that the remains exhumed from beneath a council car park in Leicester are those of Richard III, the last Plantagenet king of England. The skeleton reveals many things but maybe two of the most interesting are: the king was not a hunchback (although he did suffer from severe scoliosis) and he did not have a withered arm. So, why did Shakespeare write the play he did? Well, first of all you have to admit that it’s a good story – and as I said Shakespeare was a story-teller. But there may be another reason. William Shakespeare was reliant on patronage. He needed an income. It is fairly certain that one of his early patrons was Ferdinando Stanley, Lord Strange. In fact Lord Strange’s Men are linked to the first performance of Richard III and it is probable that Shakespeare wrote the play for them. If you know anything about the battle of Bosworth, you will know that the main reason Richard died is because he was not supported by the Stanley family. Thomas Stanley, who was the father-in-law of Henry Tudor, seems to have watched from the sidelines until he was sure who would win. His brother, William Stanley, led the attack on Richard and it was he who seized the crown and put it on Henry Tudor’s head, although in Shakespeare’s play it is Thomas Stanley who is credited with the act. It is also recorded that Henry Tudor’s standard bearer at Bosworth was a man named William Brandon. Richard killed him in his attempt to reach Tudor and engage him in a hand to hand combat. Ferdinando Stanley, Shakespeare’s patron, was the direct descendant of Thomas Stanley. On his mother’s side he was also descended from William Brandon. According to the will of Henry VIII he was, after his mother, Margaret Clifford, the heir to the English throne if Elizabeth I died childless. I don’t think he would have been impressed if his playwright had written a play that eulogised Richard III. In fact, Shakespeare’s patron may have demanded a play that reminded Queen Elizabeth of the crucial role the Stanleys had played in putting the Tudors on the throne – a play that would reinforce his own claim to be her legitimate heir. It could be that William Shakespeare did not have an entirely free hand in his writing. He was probably forced, at that early stage in his career, to please his patron by producing work that pleased him. So, maybe he should not take all the blame for blackening Richard’s reputation. Instead, the fault should lie with those who have relied on fictional rather than factual sources to inform history. If today’s announcement changes anything, I hope it will be that more focus is put on the facts surrounding the reign and death of Richard III and that there will be an analysis of what was written about Richard before and after his death at Bosworth. For example the medieval historian John Rous praised Richard as a ‘good lord’ before Bosworth and it was not until the reign of Henry Tudor that he wrote about him being ‘born with teeth and shoulder-length hair after having been in his mother’s womb for two years’ – a comment he must have known at the time was ridiculous. But maybe he too was constrained by what he was being pressured to record. Maybe the blame does not lie with Shakespeare, or John Rous, or even Thomas More. Perhaps the blame lies with those who they were forced to please. The men who held power. The victors. The Tudors. Richard III’s remains by no means prove he did not have a “withered” arm. I read somewhere that his was a difficult birth. This is typically the cause of cerebral palsy as the infant is deprived of oxygen during birth. The bone is normal, the damage is to the nervous system which affects musculature. Finding a normal bones of R3’s arm does not mean his arm’s soft tissue was fully developed and functional. Any pediatrician or doctor interested in the findings of R’s burial place should have spoken to this by now. The truth is that skeletal remains cannot tell us if his arm was functional or withered as the flesh is not there and that is where the answer would be found. I think if he had an arm that was not as functional as typical is more admirable than not. Look at all he accomplished including riding a war horse. Who cares if he had a weaker, less developed arm? Why does that make him less than? I think it makes him more than average. In high school I had a friend who had mild cerebral palsy resulting in one arm slightly smaller and much weaker than her other. She lived a full life and later became a successful business woman and mother. I find this focus on R3’s not having a withered arm petty and unkind to the man who lived a remarkable life as well as to all people who have physical differences as if they would have been so much better if they were typically formed. R3 was the way he was, whether as described as a near demon in Holinshed on which Shakespeare modeled his R3 or the great man the Ricardians portray. The truth is that skeletal remains cannot tell us if his arm was functional or dysfunctional to whatever degree, and science can corroborate that the bone can be quite typical. I hope folks are willing to look into that for themselves and appreciate how much a person can accomplish even with a physical deformity. I’m not saying R3 did or did not have a withered arm. I cannot nor can anyone at this time know that for sure. But if he did, it made him more accomplished, not less. Hello Paige. Thanks for your comment. Your thoughts on disability are commendable. However, you have to remember that you can’t approach history from a modern day perspective. People’s beliefs and ideas were different back then and at the time a disability was often seen as a sign of evil. I’m sure that was what John Rous was trying to portray when he wrote his Historia Regum Angliae – dedicated to Henry VII – between 1485 and 1491. He also wrote that Richard was ‘retained within his mother’s womb for two years and emerging with teeth and hair to his shoulders’. That’s not very likely and I wonder what evidence he had of a difficult birth over 40 years after the event and with no connection to the family. As for who cares if he had a withered arm. Well, it may not seem important to us now, but at the time it was used as an example of his wickedness when he was written about after his death. History is indeed written by the victors but I frankly don’t get the Ricardians. First of all the seconf Richard had himself decided he was going to be King, he also decided Edwards boys has to die. If he did not order their deaths or plan their killing he was an incompetent fool! His throne would never be secure if they were alive. Richard had news of their death spread through Europe. If they were alive he would have produced them to quell the disgust. This is a man who became king of the backs of his nephews and yes deeply betrayed his brother. Does this mean he did no good things as King. No. It was brutal times. But he also insured he was going to get rebellions. How do you know what Richard decided? The only way history can be judged is on evidence. No one can possibly know what his private thoughts were, and his decisions can only be judged through their consequences. That is what makes history so interesting and leaves it open to interpretation. I have taken an interest in Richard III since his grave was discovered and have found this blog further evidence that Richard did not murder his nephews and was in fact a good King. I wonder if Elizabeth the elder sister of the young princes had her own ambitions for the throne, afterall she did marry Henry VII. I doubt Elizabeth could have ruled alone. It was a time when kings had to be warriors and lead men into battle. No one would have seen it as a role for a woman, which is why her son, Henry VIII, was so desperate for a male heir. Yet it was her grand daughter, another Elizabeth, who proved how effective a queen could be. The image of villain, assassin of his two nephews and usurper of the throne of England, popularized by Shakespeare (1564-1616), was very probably inspired by the biography of Richard III who wrote in English Thomas More (1478-1535). More, when he was young was at the service as a page of Cardinal John Morton (1420-1500) and he had translated, nearly at the foot, the slanderous libel written in Latin by Cardinal Morton , who conspired to help Henry Tudor (1457-1509) and to overthrow all traces of the one who was a very good king of England, Richard III, massacred at the Battle of Bosworth in 1485, a few miles from Leicester. What about the hypothesis of Josephine Tey in her novel “The Daughter of Time” (Random House, 1951, new edition en Arrow Books en 2009)? I have read it, and mentioned in my blog after a one of my visits to Leicester (my daughter teaches there at the University). If true, the “History of King Richard III” by Thomas More would be in fact a text by an enemy of Richard, the bishop John Morton, mentor of Thomas, who was his page. Yes, I’ve read A Daughter of Time. I think it is probable that Thomas More’s version was something that Shakespeare read and drew on, but I also wanted to highlight his personal connection with the Stanley family that is often overlooked. Yes Florence your right Olivier’s film of Richard 111 kick-started my interest. Brilliant performance but Shakespeare’s view not mine. I believe Tudor propaganda was at work regarding Shakespeare’s play of Richard 111 and some of the storyline was passed down by people like Thomas More. I don’t think that Richard was the monster Shakespeare said he was murdering nearly all his family to obtain the crown of England. I have been looking into Richard 111 for many years as I wanted to look at him from a different perspective other than Shakespeare’s. I joined the Richard 111 society not so much because I am a monarchist because I am not but I think this period that Richard lived and died in is a very interesting time in England’s history. Richard 111 in his short reign did bring about reforms ie in the law and certain other areas. I think he has been much maligned as a king and vilified since his death at Bosworth field in 1485 mostly by the Tudors who took over after his death. Personally I don’t think he had the two young nephews killed I believe they where still alive after his death at Bosworth the culprits I think could have been either Henry V11 or the Duke of Buckingham a one time supporter of Richard who went over to the Lancastrians before Bosworth I think and was executed for treason. The Princes could also have been murdered on his orders while Richard was still King as I think Buckingham held a high position in Richard’s close knit circle of nobility. My argument is if Richard took the throne as King if his two nephews where not born of a legal marriage as Edward 1V is said to have promised his hand in marriage before Elizabeth Woodville what really did he have to fear as he was the rightful heir as George Duke of Clarence his older brother had been executed for treason some years before. Good comment Carole so much interesting history and from some of the other people regarding this site. Did you get interested in Richard 111 through Laurence Olivier’s film I did although as you say you wanted to look at Richard from a different perspective not just Shakespeare’s play. I think sometimes history can get twisted to suit the historians who come after the event and that certain happened with Richard 111 poor chap. Yes, Buckingham was executed for treason. He asked to see Richard before his execution, probably hoping to persuade him to revoke his death sentence, but Richard refused to see him. He seemed very upset to have been betrayed by a man he thought was his friend. I don’t believe in ghosts but it is said that Buckingham haunts Debenhams in Salisbury, the place of his execution. Of course it wasn’t Debenhams at the time! I’m pleased to see these interesting and well informed responses to my original article, but please remember that you are on my blog, which is a bit like being a visitor in my house. Debate is welcome, but don’t let it degenerate into a fight. Further Colingbourne was executed for writing to Tudor and urging him to invade England and take the throne – i.e. he was a traitor to his king, not for the seditious verse that he wrote. I’m not sure what point you are making about the portrait in relation to being a hunchback as the physical remains clearly prove that Richard was not a hunchback but rather suffered from Scoliosis which would not have been visible when clothed. The hunchback story came after his death because people saw him naked after the battle, thrown over a horse and this accentuated the spinal curve. The Tudors certainly exploited this to suggest that Richard was a twisted and deformed tyrant because it was a propaganda goldmine. Shakespeare, as a dramatist, added more and more to the physical deformity as it was the perfect tool for making Richard into a pantomime villain and because there was thought to be a connection between physical deformity and evil character at that time. Robert Cecil would also have found the depiction particularly uncomfortable and there was a political element in the depiction that would not have been lost on contemporary Shakespearean audiences. The rumours of the murder of the princes were most certainly spread and utilised by Henry Tudor and his supporters during the period before Bosworth when he was in exile. Bishop Morton, fled to the continent after his abortive attempt to bring Richard down through the Buckingham revolt and took with him the rumour of Richard’s crimes against his nephews which he then used to support Henry’s attempts to gain financial and military backing and these rumours continued to be spread through the courts of Europe. This does not prove that they were true. It shows that Henry Tudor needed the boys to be dead in order to strengthen his very tenuous claim to hereditary descent from Edward III! He used the rumour of their deaths to win over Yorkists to his side before Bosworth and sent agents into Richard’s army on the eve of the battle to further undermine him and draw off support. Really David you need to use the arguments that have some basis in reality if you are to convince anyone. Further Thomas More said that Robert Brackenbury refused to murder the boys at Richard’s request because it revolted him yet ends up fighting loyally for his king at Bosworth which hardly seems consistent! If Richard was such a monster that Rous was forced to write good things about him for fear of being hung, drawn and quartered then it seems inconceivable that Richard wouldn’t punish a servant who failed to carry out a murder that meant so much to him, doesn’t it? Interesting … though the blame always lays with the person who chooses to speak or write known lies in my opinion. Shakespeare had a choice and he chose sycophancy and slurs, which have had a poisonous legacy that extends far past his intended target. This play is a prime example as to my own conviction that Shakespeare was not the sole person, but other persons who penned most of the other known works. ( My University thesis was based on this argument.) If the Tudors, as victors wanted to paint Richard and his family – as murderers, they didn’t have to look further. Plus the disjoined bits of information and facts where perhaps given not only to just Shakespeare but collected by various members of the troupe! Hence, the Queen’s (Elizabeth l) henchmen or censors had an easier task in persuading just one person or persons to come up with this piece of 16th century propaganda, which in my opinion turned out to be a first class character assassination. There is no inconsistency with Richard’s being both a ruthless eliminator of any threat to his position, while being a fair administrator – he would have seen it as part of the role he was born to play. John Rous’s earlier comments could also have been made under duress or the fear of suffering the same fate as William Collingbourne. Henry Tudor did not have the habit of executing people who wrote something he didn’t like. Another contemporary whose career it is worth studying is Sir Robert Brackenbury, who rose to be one of the wealthiest people in the land, while being Constable of the Tower of London. Richard’s man to the end, he died at his side at Bosworth. The stories of Richard’s character and his having his nephews murdered were not invented by the Tudors, but were current at the time. In Brittany, Duke Francis II financed Henry Tudor’s army and Navy for the 1483.The older of the Princes was engaged to Anne of Brittany, his elder daughter. Richard managed to bribe Pierre Landais to hand Henry over to him, but he managed to escape to France, where The court had the resources to finance the Bosworth expedition. There Philippe de Commynes records that Richard was considered to be a tyrant and responsible for the Princes death. Richard was sensitive to damaging rumours, because when he was falsely accused of considering marriage to his own neice, he acted to have the rumours contradicted. But he made no attempts I know of to combat the perception of him on the continent or at home regarding the Princes. I find the modern Ricardians to present a disingenuous argument. The altered painting / scoliosis is not a hunchback – see the official painting of Margaret of Bavaria – it shows no sign of her condition. It is going to be the original that is flattering. I have always–as an historian–had a problem with the Richard III story, chiefly because details have been provided which absolutely no one could or would have known. Think, for instance, about all the other tyrants in England’s past–name Edward I, Bloody Mary, Henry VIII, Charles I and instantly, you can recall the reasons for their eternal infamy. But if you take out the boys in the tower business, can anyone remember anything, anything at all, about Richard? No. They especially don’t remember that he reigned for just over two years and was only 32 when he died. Then the boys in the tower. When kings died ‘in custody’ shall we call it, the victors didn’t tend to announce the time of death and the way of it. There’s usually an announcement sometime after the event which is vague in the extreme. And going into the Tower to do the deed? If one is popping in for a spot of murder, is it likely that one would sign the visitor’s log? It’s just all too much Tonypandy for me, I’m afraid. Good play…but so is Macbeth and that’s a load of old cobblers too. It is true though…history is written by the victor. I do believe that he was a victim to history and to his own greed of wanting power. Though I believe there is some fact in the fiction…many rulers back then were not the best – to say the least. Interesting – I read once that history is written by the victor! Perhaps this is the case here?